in the Heart of the Beautiful Ariège Pyrenées Countryside. A warm welcome awaits visitors to 'La Maire', a newly renovated 200-year-old farmhouse nestling in over 3 acres of beautiful grounds and offering wonderful views of the glorious Ariège countryside with glimpses of the high peaks of the Pyrenées, which are just a short drive away. On the outskirts of the hamlet of St Victor Rouzaud, La Maire is off the beaten track yet just 15 minutes drive from Pamiers, 25 minutes from Foix and about an hour from Toulouse. A perfectly positioned base from which to explore this beautiful, historic and unspoilt corner of France. The Ariege is wonderful for cycling, walking and bird-watching and there are many places of interest nearby, including traditional French towns, villages, Cathar castles, caves and lakes. 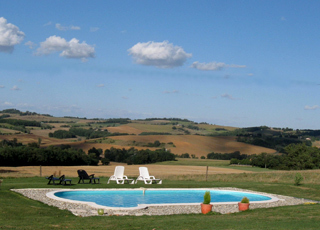 Lesley and Dave Olver moved to La Maire in March 2010 and love welcoming visitors to this wonderful corner of France. amazing hospitality, made for an unforgettable stay."